The smartphone is not only a device in today's time but it has become our requirement. With the use of smartphones we can do many tasks and fun. But there are many Specialty & flaws in the smartphones, which can be dangerous for you. 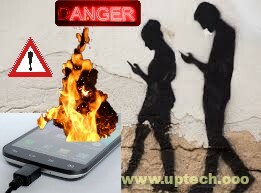 We are going to tell you 5 mistakes can make your smartphone dangerous. * The truth is that most people of today can not live without smartphone. You may hear the news of a smartphone being blasted many times. If you are love to playing games or calling on the smartphone, Then do not charge your smartphone during playing game or calling. Actually charging the phone during the game or calling, its battery and smartphones starts heating up. In such a situation, there may be danger of phone bursts. Many times it happens that the user starts using other (third party's) charger when the phone's charger gets spoiled or lose. If you are doing such a mistake then immediately stop doing so. Fake charger can harm your phone's battery and performance. In this case, there may be risk of battery bursts. If your phone is drenched in the water, do not forget the charger or the earphone in the bluff. It would be good to switch off your phone during this time. Wetting or moisture can make short circuits inside the phone. If you like to take photos in the rain or water, then you should buy waterproof smartphone or camera. Avoid sleeping by keeping the phone with you, especially if you are sleeping by putting the phone under a pillow. Many doctors believe that mobile radiation affects your mind, which does not bring you a good sleep. Keep some distance between you and smartphone during sleeping. Although debate continues in many places on this issue, doctors believe that the phone should not be kept in shirt pocket. Actually, radiation emanating from the phone can have a bad effect on your health. If you are out of the house, while using the phone, please be aware that the phone is not hot. Actually, when the phone is used in the sun, it starts getting hot. In this case, it may have a bad effect on your phone's battery or on the performance. Antivirus app reality | Does Antivirus App Works ?